Grab the newest emote in Fortnite now, and spring around the battlefield showing off your moves. Another day, and another new item has sneaked into the Fortnite Item Shop. 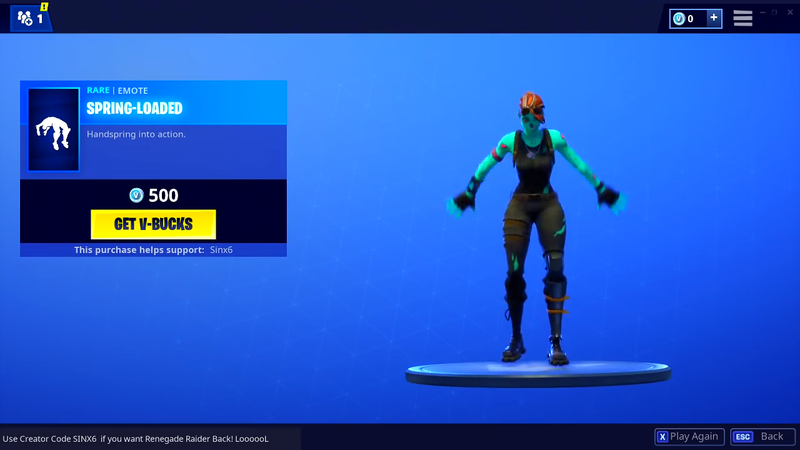 This time around, you can look for the Spring-Loaded Emote, which is all about making your avatar jump around like a loon, as if they're, well, spring-loaded. The new Fortnite emote costs you 500 V-Bucks, and it's probably best used when you're celebrating something, like a kill from across the map, perhaps. Its official caption is "Handspring into action," and it's a rare emote. It's very animated, we'll give it that. “Get to high ground or build above the lava that’s overtaking the island.”. Epic will be implementing a variety of bug fixes when the LTM hits, because players have been having a variety of issues with the game in the state it's in at present. The LTM is scheduled to become available at some point this week on either Tuesday and Wednesday, so hopefully we'll see it added soon enough.